Director Philip Ridley has made a handful of memorable, if difficult to watch, films since his debut in 1988. 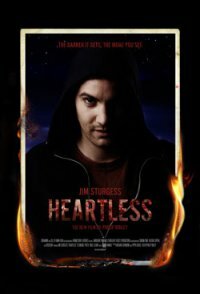 Iâ€™ve only seen The Reflecting Skin, a film with such powerful images that some still stick with me today, but Iâ€™m always willing to see what the director has on offer next and considering the long breaks between projects and a cast like this one, itâ€™s even harder to overlook Heartless. When his [Jamieâ€™s] mother is viciously murdered, the media reports itâ€™s by a hoodie wearing a devil mask. But Jamie soon realizes the thugs arenâ€™t wearing disguises at all; they really are demons and hell on earth is beginning to plague the capital city. Yet all is not what it seems in enfant terrible Ridleyâ€™s unique horror fantasy landscape ingeniously informed by the current climate of fear running through every strata of modern society. We havenâ€™t seen a whole lot from the film but a video interview with co-star Noel Clarke gives us our first glimpse at Sturgess in the lead role and a preview of what we can expect from Ridleyâ€™s newest work. Our UK correspondent wasnâ€™t a big fan of the film but considering how dividing Ridley's other works have been, I canâ€™t help but want to see it for myself. Clip after the break. Thanks to Diane from Jim Strugess Online for the heads up.